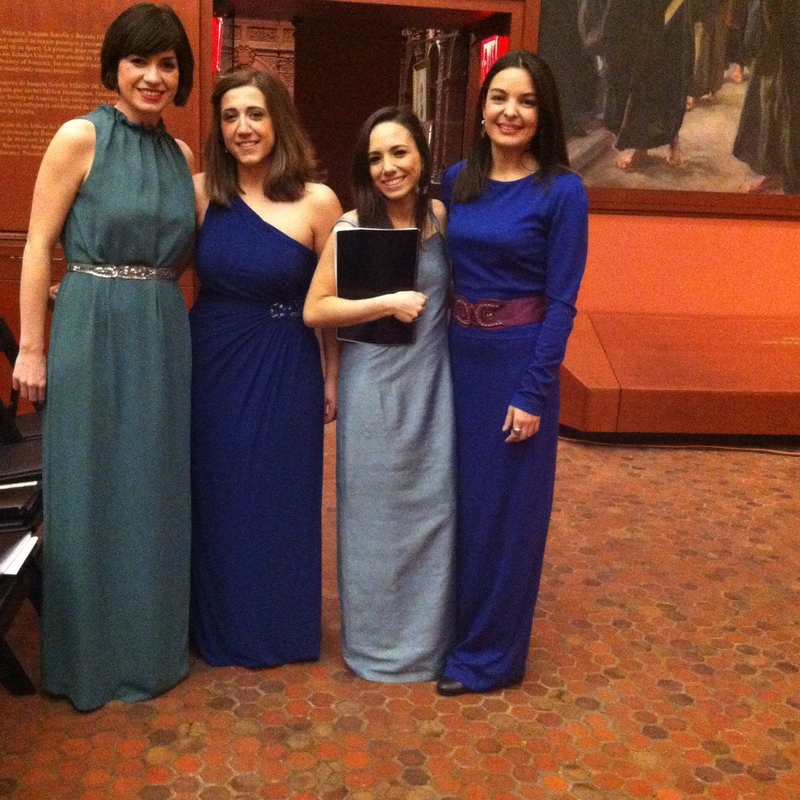 The auspicious New York debut of the Spanish early music group Musica Ficta took place earlier this week in the Sorolla Room of the Hispanic Society of America in New York City. The vocal ensemble, led by conductor and founder Raúl Mallavibarrena is on a tour on this side in the Atlantic, and essayed a concert that centered in both sacred and profane vocal works entitled Columbus: Gateway to the New World, essaying composers such as Juan de Araujo (b. Spain 1646. d. Bolivia, 1712), Francisco Guerrero (Spain, 1528-1599) and Tomás de Torrejón y Velasco (b. Spain 1644, d. Peru 1728). 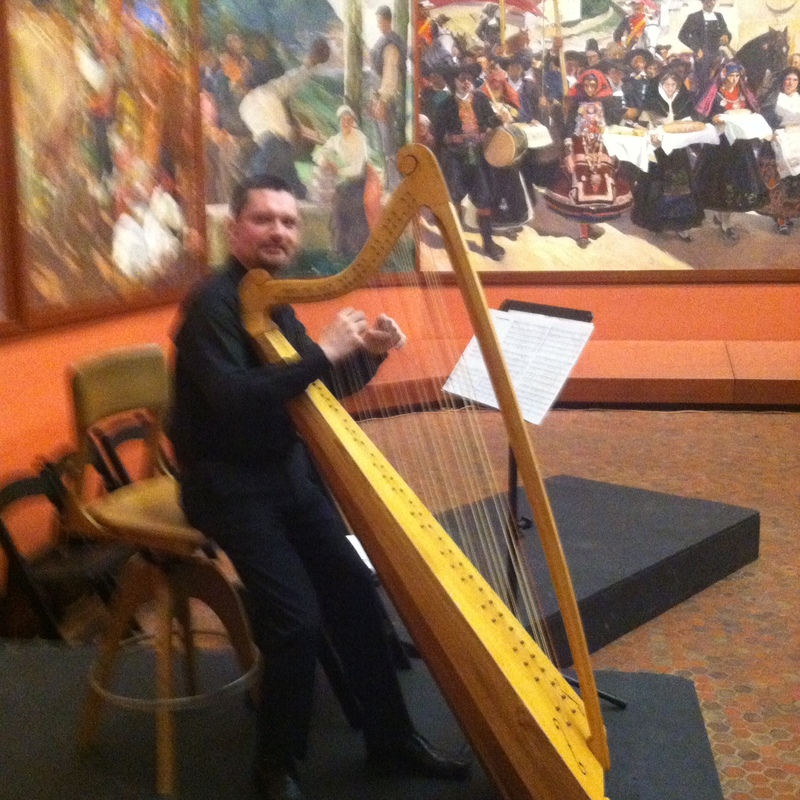 When not singing A cappella, the group was accompanied by the Spanish baroque harpist, Manuel Vilas. 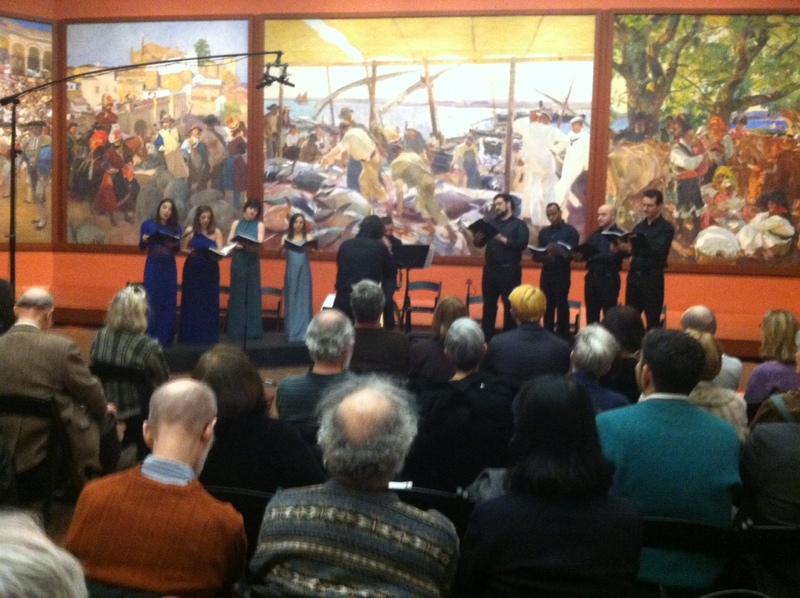 The concert was presented by GEMAS: Early Music of the Americas, this particular concert was a collaboration with the Hispanic Society of America. GEMAS is a project of Americas Society and Gotham Early Music Scene devoted to early music of the Americas with Nell Snaidas and Sebastián Zubieta as co-artistic directors. Performing in what is certainly one of New York City’s most unique rooms, within the incomparable frame of Sorolla’s “A Vision of Spain”, the evening was a multi sensory experience. After a brief introduction by the co curator of the Hispanic Society Margaret McQuade and music director of the Americas Society Sebastian Zubieta, Maestro Raúl Mallavibarrena took the audience on a journey of Spanish baroque repertoire that was performed in the New World, both by composers of Spanish birth and of origins in Colombia, Mexico and Peru. The program notes that “the concert features works from American archives and codices, from Puebla, Oaxaca, Mexico City, Sucre Bolivia and Bogota Some are written in native languages, such as Nahuatl and Quecha”. One of the highlights of the evening was precisely the sacred settings, several anonymous and one piece by Gaspar Fernández (b. Portugal 1570, d. Mexico 1629) in the language of Nahautl, that both intrigued and charmed the audience at Hispanic Society. The intricate polyphonic music, which is at the heart Spanish golden age musical culture shined brightly in the nuanced and expressive singing of the vocal ensemble, which at times was lead by the well modulated soprano of Rocío de Frutos. The call and response sequences and interplay of polyphonic vocal music, all of the highest order, can only lead one to guess all the treasures still to be discovered and savored…the evening was filled with “Spanish gold”, indeed. Harpist Manuel Villas sensitive accompaniment as well as his interpretation of a piece for solo baroque harp by Lucas Ruiz de Ribayaz (b. Spain 1626, d. Peru?) was a wonderful vehicle to display many moments of virtuosity. Founded in 1992, Musica Ficta has presented in Spain’s most important festivals. No strangers to the recording studio, the group currently records with disc label Enchiriadis, and have produced intriguing projects such as Músicas Viajeras, which explores the Christian, Sephardic and Muslim musical culture of the Iberian Peninsula, El Cancionero de Turin which explores music in the times of Miguel de Cervantes of Don Quijote fame. and a disc dedicated to that master of vocal polyphonic music, Tomás Luis de Victoria entitled Tenebrae Responsories. The capable direction of Maestro Mallavibarrena was in evidence the entire evening. I very much appreciated how the ensemble although tight knit, gave play to hear the individual voices and personal interpretations of the artists. In the course of the evening each one had a small shinning moment. Mstro. Mallavibarrena is to be congratulated on his vision, scholarship and artistry, as well as his efforts to bring his Musica Ficta to New York City. The audience at the Hispanic Society of America and myself included sincerely hope they will return soon to our shores.